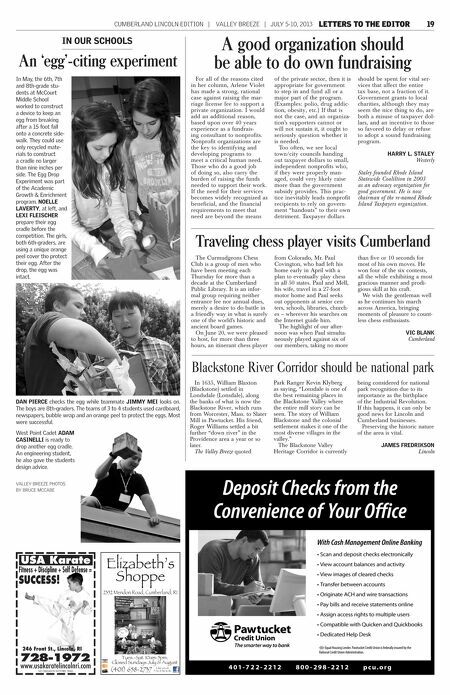 18 SCOUTING JULY 5-10, 2013 | valley breeze | cumberland lincoln edition Tiger Scouts from Cub Scout Pack 64, Saylesville, visit Calise Bakery in Lincoln for a tour of the facilities. Hanging outside by the company's sign with their free samples of bread are Scouts Andrew Shaub, left, Devin McCaffrey and Aidan Herrara. For information on joining Pack 64, visit http://www.coolcubs.com/saylesville64 . 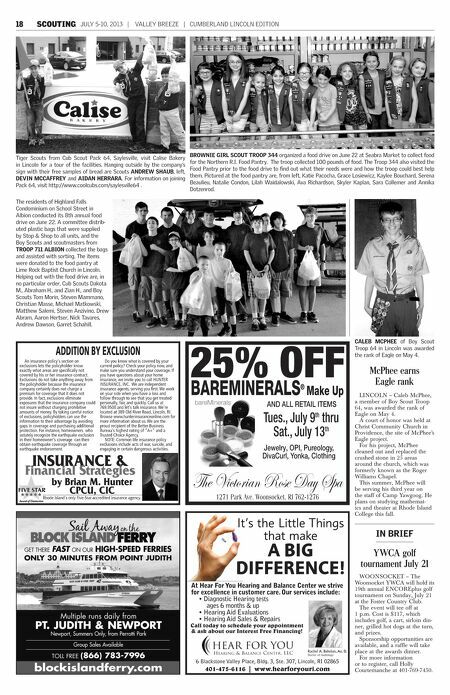 Brownie Girl Scout Troop 344 organized a food drive on June 22 at Seabra Market to collect food for the Northern R.I. Food Pantry. The troop collected 100 pounds of food. The Troop 344 also visited the Food Pantry prior to the food drive to find out what their needs were and how the troop could best help them. Pictured at the food pantry are, from left, Katie Pacocha, Grace Losiewicz, Kaylee Bouchard, Serena Beaulieu, Natalie Condon, Lilah Waidalowski, Ava Richardson, Skyler Kaplan, Sara Collemer and Annika Dotzenrod. The residents of Highland Falls Condominium on School Street in Albion conducted its 8th annual food drive on June 22. A committee distributed plastic bags that were supplied by Stop & Shop to all units, and the Boy Scouts and scoutmasters from Troop 711 Albion collected the bags and assisted with sorting. The items were donated to the food pantry at Lime Rock Baptist Church in Lincoln. Helping out with the food drive are, in no particular order, Cub Scouts Dakota M., Abraham H., and Zian H., and Boy Scouts Tom Morin, Steven Mammano, Christian Masse, Michael Matkowski, Matthew Salemi, Steven Anzivino, Drew Abram, Aaron Hertser, Nick Tavares, Andrew Dawson, Garret Schahill. ADDITION BY EXCLUSION An insurance policy's section on exclusions lets the policyholder know exactly what areas are specifically not covered by his or her insurance contract. Exclusions do not take anything away from the policyholder because the insurance company certainly does not charge a premium for coverage that it does not provide. In fact, exclusions eliminate exposures that the insurance company could not insure without charging prohibitive amounts of money. By taking careful notice of exclusions, policyholders can use the information to their advantage by avoiding gaps in coverage and purchasing additional protection. For instance, homeowners who astutely recognize the earthquake exclusion in their homeowner's coverage can then obtain earthquake coverage through an earthquake endorsement. Do you know what is covered by your current policy? Check your policy now, and make sure you understand your coverage. If you have questions about your home insurance, we invite you to call HUNTER INSURANCE, INC. We are independent insurance agents, serving you first. We work on your side when you have a loss and follow through to see that you get treated personally, fair, and quickly. Call us at 769.9500 and let's talk insurance. We're located at 389 Old River Road, Lincoln, RI. Browse www.hunterinsuranceonline.com for more information about us. We are the proud recipient of the Better Business Bureau's highest rating of "A+" and a Trusted Choice Agency. NOTE: Common life insurance policy exclusions include acts of war, suicide, and engaging in certain dangerous activities. INSURANCE & Financial Strategies by Brian M. Hunter CPCU, CIC Rhode Island's only Five-Star accredited insurance agency. 25% ALS OFF BAR EM I NER ® M a ke Up AND AL L RET AIL IT EM S Tues., July 9th thru Sat., July 13th Jew elr , O P I, P u r y eology, D ivaCu r Yon ka, Clot g l, hin The Victorian Rose Day Spa 1271 Park Ave. Woonsocket, RI 762-1276 It's the Little Things that make A BIG DIFFERENCE! At Hear For You Hearing and Balance Center we strive for excellence in customer care. Our services include: • Diagnostic Hearing tests ages 6 months & up • Hearing Aid Evaluations • Hearing Aid Sales & Repairs Call today to schedule your appointment & ask about our Interest Free Financing! 6 Blackstone Valley Place, Bldg. 3, Ste. 307, Lincoln, RI 02865 401-475-6116 | www.hearforyouri.com Caleb McPhee of Boy Scout Troop 64 in Lincoln was awarded the rank of Eagle on May 4. McPhee earns Eagle rank LINCOLN – Caleb McPhee, a member of Boy Scout Troop 64, was awarded the rank of Eagle on May 4. A court of honor was held at Christ Community Church in Providence, the site of McPhee's Eagle project. For his project, McPhee cleaned out and replaced the crushed stone in 25 areas around the church, which was formerly known as the Roger Williams Chapel. This summer, McPhee will be serving his third year on the staff of Camp Yawgoog. He plans on studying mathematics and theater at Rhode Island College this fall. in brief YWCA golf tournament July 21 WOONSOCKET – The Woonsocket YWCA will hold its 19th annual ENCOREplus golf tournament on Sunday, July 21 at the Foster Country Club. The event will tee off at 1 p.m. Cost is $117, which includes golf, a cart, sirloin dinner, grilled hot dogs at the turn, and prizes. Sponsorship opportunities are available, and a raffle will take place at the awards dinner. For more information or to register, call Holly Courtemanche at 401-769-7450.